For the first of our reprints from Kalki, we have selected "James Branch Cabell at William and Mary: the Education of a Novelist," by William L. Godshalk.This article was originally published in The William and Mary Review, 5 (1967). It was reprinted in Kalki, Vol II, No.4, Whole No.8 (1968), and reappeared once again in the book In Quest of Cabell: Five Exploratory Essays, by William L. Godshalk, Revisionist Press, New York, 1975. Professor Godshalk has been one of the very first contributors and supporters of the Silver Stallion, and he has kindly given permission for us to reprint his article. We think it very appropriate that this be our first offering. In the 1920's, James Branch Cabell was one of the best known contemporary authors. From 1904 to 1930, he published twenty-nine books, one of which, Jurgen, gained notoriety as a result of an unsuccessful attempt to suppress it in New York because of its supposed indecencies. In general, Cabell's novels were well received; and Carl Van Doren, H. L. Mencken, and Warren McNeill between 1927 and 1932 published full-length studies of the Cabellian artistry. Much like Eliot's Wasteland, Cabell's novels are replete with learned allusions, and in the late 20's James Cover and John Phillips Cranwell provided explanatory notes to Jurgen and Figures of Earth—suggesting a wide public interest. During the period, Cabell was a regular and distinguished contributor to the Smart Set, and the short story which grew into Jurgen first appeared in its pages. Among the literary men of the time, Cabell's circle of friends was large: Sinclair Lewis, Joseph Hergesheimer, Carl Van Vechten, Burton Rascoe, Arthur Machen, to name a few. In his Nobel Prize Address in 1930, Lewis mentioned Cabell as one of the three American writers, along with Hemingway and Faulkner, worthy of the attention of the Swedish Academy. All in all, Cabell's reputation in the 20's must have seemed unassailable. But fortune's wheel turned, and the years that followed his initial popularity gave rise to a series of hostile critics. Cabell's novels were attacked from almost every conceivable position: stylistically, ideologically, socially, personally. In 1933, Granville Hicks, abdicating the critic's responsibility of balanced judgment, strikes at the author himself, calling him "a sleek, smug egoist," and his work "a structure of lies." Hicks begins the series of attacks; and Oscar Cargill in Intellectual America (1941), after damning "Cabell's reputation as a stylist" as "overblown," attempts to have the final word. He sums Cabell up "as a museum piece representing the psychology of a Virginian who would be an intellectual leader yet had not quite what it takes." However, the 1950's had better words for Cabell. Edward Wagenknecht in the Cavalcade of the American Novel (1952) reminds us that "James Branch Cabell …is still a unique and incomparable figure in American literature ... He will never be the voice of a 'party' or of a 'movement'; he will never speak for anything smaller or more limited than the human spirit itself." Four years later, Edmund Wilson in a long article in the New Yorker suggested that Cabell's work had been maligned by partial critics and called for a reevaluation of his novels. In the 60's two book-length studies have appeared, and a biography is in preparation. Joe Lee Davis concludes that "one must—in common decency and simple justice—rank him among the major rather than the minor authors of the twentieth century... . Cabell is both the Spenser and the Boccaccio of the second American Renaissance. "2 After years of neglect, Cabell's work is again receiving the attention it deserves. His major achievement is the series of eighteen novels he called "The Biography of the Life of Manuel." Technically written in the romantic form and the comic mode, the novels trace the lineage of Count Manuel from a mythical French province of Poictesme to Lichfield, Virginia. Although Cabell with tongue in cheek suggested that his volumes were to be read "simply" as stories "for pastime" wherein "neither morality nor symbolism is ... educed,"3 the romances indeed form a symbolic commentary on the human situation. Torn between the ideal and the real, Cabellian man is forever thwarted in his quest for the ideal by the demands of the real. Cabell explores all the aspects of this human dilemma, perhaps reaching the conclusion that man can never achieve his ideals, simply because he must exist in the world of reality; and yet, for his self-preservation in that world he must, paradoxically, cling to these very ideals, unrealized, unrealizable. Even in the face of materialistic denial of spiritual value, man must believe in some kind of transcendent worth. Although the meaning of Cabellian comedy can be comprehended without the ability to recognize each learned allusion, the incidents of the novels are often based on classical, Russian, Hebrew, medieval, and even Aztec myths and legends. The reader is quite obviously in the presence of a learned author, and many of Cabell's intellectual pursuits can be traced to his college years. 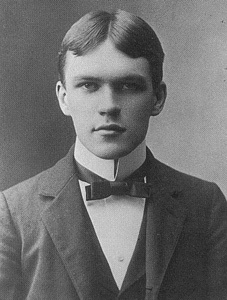 In 1894, at the age of fifteen, James Branch Cabell entered the College of William and Mary. When Cabell came to Williamsburg in the fall of that year, the College was small, with 160 students, all men, and by the end of Cabell's four-year stay, the enrollment had increased by only thirty. The complexion of the College was provincial, with most of the students from within the state, and a very few from the surrounding areas, Washington or West Virginia. Many of the students were from rural backgrounds, and Cabell is said to have stood out in his city dress, yellow gloves and cane. According to the records, a majority of the students was planning to become teachers, and Cabell was one of forty who did not list his intention to enter the profession. The faculty included only seven professors (called by the students "the Seven Wise Men," perhaps in half-jest), each teaching one or more of the disciplines of study. Professor John Lesslie Hall, for example, taught both English and history. Three or four instructors or assistants, often drawn from former graduates or even from the student body, filled out the faculty. The small library with its very high shelves was open only during certain hours, and Charles W. Coleman, who had gained a name as a "Virginia poet," was the librarian whose duty it was to direct the reading of the students. Cabell and those students of literary taste and ability were drawn to Coleman, "the poet in residence," and Cabell later said that Coleman along with Professor Bishop had introduced him to classical, medieval French and Provençal literature, all lasting influences on his later work. To friends, Cabell confided that Coleman was the prototype of his fictional character "Charteris," who in Beyond Life lives in the small town of "Fairhaven" with an eighteenth-century background and a small college. Young Cabell was doubly fortunate, for he was boarding with Mrs. Cynthia Beverley Tucker Coleman, with whom, Charles Coleman, her son, lived also. The College had few dormitories, and most students lived in certain approved boarding houses in the town. Mrs. Coleman taught one of the Bible classes at Bruton Parish Church, at which young Cabell sang in the choir. On Campus, several fraternities were active, including PBK, and Cabell belonged to Alpha Sigma Alpha which merged with Kappa Alpha in 1896. We may conjecture that Cabell was quickly forgiven his city manners and dress. Dances were held, and young ladies attended. Professor Bird, the youthful teacher of Pedagogy, and his wife were often present and mingled freely with the students. Public lectures and debates were sponsored, though the students were perhaps more interested in the "pretty frocks" present from town than the actual words of the speakers. In 1896, Charles Coleman gave an informal talk to Professor Hall's English Club on contemporary literature. "The authors of which he spoke were principally Southern writers," says the report in the William and Mary College Monthly (V, 221). Coleman illustrated his talk with photos and autographs. On the other hand, when Jones's Pond froze in the winter, most of the students went skating. Life at the College had many aspects. Sports were also played on the intercollegiate level. At one point in Cabell's senior year, as the baseball season was approaching, the student Athletic Association felt that the team lacked a suitable pitcher and so petitioned the faculty to allow one to be searched out and enrolled in the College—without attending classes—that he might legitimately play for the William and Mary team. Denouncing the concept of "professionalism" in college sports, the faculty denied the request. A few months before, during the football season, one of the College players had been expelled for appearing on the field with "dirty words" written in black ink on his jersey. His request to return was denied, perhaps because he had also broken down the door of his room and had been guilty of other disorderly conduct. Obviously, the "Virginia gentlemen" were at times less than the code demanded, and life at the College was a little more racy than the College Catalogue would have led parents to believe. One can hardly think that Cabell felt extremely repressed by the stultifying social atmosphere of a conservative Virginia college. At the same time, it has been suggested that Cabell was, at William and Mary, inhibited intellectually rather than socially, and thus turned to his teachers and advisors for mental companionship. Although this may indeed have been the case, with our present store of facts it seems impossible adequately to determine. We can observe, however, that Cabell did not neglect his studies, and each year saw him gain several Certificates of Distinction: his freshman year in Greek and French; his sophomore year in English, Greek, and French; his junior year in English, mathematics, Latin, Greek, and German; his senior year in "Moral Science, Political Economy, and Civil Government" and in history. We have record of Cabell's taking courses and distinguishing himself in every area of study offered at William and Mary except "Natural Science" and "Pedagogy." The diversity of his studies suggests the width of both Cabell's interests and his abilities, which, in turn, are reflected in his later writings. However, as his Certificates of Distinction and his later novels indicate, Cabell's forte was languages, and his most influential professor, Charles Edward Bishop, who helped introduce him to the glories of ancient Greece and medieval France. With his doctorate from Leipzig, Professor Bishop taught Greek, French, and German. In an editorial in the Monthly (V, 66-67) the student editor complained that Bishop was vastly overworked by the College, having little time for his own scholarship; he was lecturing more than 20 hours a week. Many of Bishop's methods and aims of teaching language may now seem outdated; but one of his major aims, "to read the great thoughts, aspirations, dreams, threats, longings of the great intellects of the world" (Monthly, VI, 275-279), helps us to understand his influence on Cabell. In personal appearance Bishop was a small man, wearing a pointed beard and glasses. During his junior year, Cabell became Bishop's assistant; and although no written record of this relationship appears to be extant, we may conjecture that it was mutually profitable, and that Cabell gained an increased knowledge of Greek and French, his favorite subjects. It was Bishop who introduced Cabell to C. C. Fauriel's History of Provençal Poetry. In his senior year, Cabell finally mustered the fortitude to take the "Junior Class" of President Tyler's "Moral Science, Political Economy, and Civil Government," which in the 1897-98 session concentrated on Moral Science: logic, ethics, history of philosophy. Tyler was an arch-conservative, fighting to preserve an age which was passing. How did Cabell react to his teaching? Did he rebel against his conservative views? At this point in his intellectual life, Cabell's views, as we shall see in his contributions in the Monthly, tended toward liberalism. Did Cabell perhaps agree with some of Tyler's tenets? Later in Jurgen, he viciously satirizes the evils of popular democracy. It is impossible to define their relationship, but we do know that when Cabell needed serious advice, he consulted President Lyon G. Tyler. Cabell also took courses under Professor John Lesslie Hall and achieved distinction. A publishing scholar, Hall's orientation was philological, emphasizing Anglo-Saxon and the history of the language. Indeed, Jurgen's "Master Philologist" blinking "through his great spectacles" (Hall wore glasses) may owe something to Professor Hall. But Hall provided young Cabell with more than a hint for a character in a later novel, and perhaps a distaste for philological scholarship. As an advanced student in English, Cabell would have studied Shake­speare under Hall, who organized a special "Shakespeare class" early in 1896. Though the standards were high, the course was popular—"the most agreeable and fascinating of all the studies that our College affords" (Monthly, V, 159). In Cabell's later fiction, the influence of Shakespeare is recurrent, and Joe Lee Davis claims that "it can …be demonstrated … that Cabell had a Shakespeare obsession" (p. 55). It is possible to trace that love of Shakespeare to Cabell's course under Professor Hall. In the Catalogue, Hall reminded his students that "essays suitable for the College magazine are required at stated intervals." Cabell was active on the staff of the William and Mary College Monthly, which combined the attributes of both magazine and newspaper. During his sophomore year, he was one of the two editors elected to the staff by the Philomathean literary society, his friend S. Otis Bland being the other. For the next two years, he edited the column called "Exchanges," a critical review of literary magazines from other colleges. At times, he doubtlessly found this uninspiring work, perhaps absolute drudgery; for the column, now and again, contains only a prefunctory notice or two. Nevertheless, touches of Cabellian wit are at times evident (e.g., Monthly, VI, 143-145). Since many of the individual contributions to the magazine are unsigned, it is nearly impossible to tell with precision how many of these are Cabell's. We do know, however, that Cabell signed some of his work with the pseudonyms "Clarence Ashley Bell" and "Charles Antrim Ballance." Under the guise of describing the Restoration wits, Cabell appears to be describing his own literary aspirations—though only in part. The final praise, in the essay, of Congreve's "all but perfect" style is perhaps an indication of one of the sources of his own. Why should we hope to know of Something higher? Shares with the Sudra in Infinity. We come from Nothing and to Nothing go. The excerpt suggests that the young poet has been reading Edward Fitzgerald's Rubaiyat: the stanzaic form is the same, and the line "We come from Nothing and to Nothing go" seems to be a reminiscence of Fitzgerald's "the phantom Caravan [of life] has reach'd / The Nothing it set out from." On the evidence of this poem, we may list Fitzgerald as one of the sources of Cabell's cosmic skepticism.4 As important as the source, however, is the attitude evinced. In his late teens, Cabell is beginning to feel the same tension between real and ideal apparent in his later novels. Man feels that it is "not fitting" (Jurgen would say "not just") that he should be trapped in a completely material world of "Raiment, Food and Fire," and yet, at the same time, he realizes the futility of seeking after "Knowledge" of "higher things." In this tension between real and ideal, man must somehow make the best of an infinitely poor situation. By November, 1897, in an article on Dickens, "In Defence of an Obsolete Author" (Monthly, VII, 1-6), Cabell was already developing his theory of romance. "A novel, or indeed any work of art, is not intended to be a literal transcription from Nature. … Life is a series of false values. There it is always the little things that are greatest. Art attempts to remedy this. It may be defined as an expurgated edition of Nature" (pp. 3-4). In his later essay "On Telling the Truth" (VII, 53-55), he expands these ideas, concluding that "if we assiduously cultivate our powers of exaggeration, perhaps we, too, shall obtain the Paradise of Liars. And there Raphael shall paint for us scores and scores of his manifestly impossible pictures … and Shakespeare will lie to us of fabulous islands far past 'the still-vex'd Bermoothes,' and bring us fresh tales from the coast of Bohemia. For no one will speak the truth there, and we shall all be perfectly happy." And these ideas are finally brought to maturity in Cabell's book of essays, Beyond Life. Two more of his college essays, "Christopher Marlowe—Poet and Dramatist" (VI, 55-61) and "Black Spirits and White" (VII, 121-129) , are also rewritten and included in this later volume. In this limited space, having glanced briefly at a few of his prose works and one of his poems, we must leave his early work on the staff of the William and Mary College Monthly in order to examine the ugliness of reality. Cabell's last months at the College were darkened by what has been called a "scandal," but was in actuality a series of vicious rumors. The origins and details of these rumors are, by their very nature, impossible to trace with any degree of accuracy. 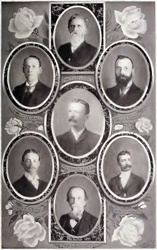 It has been conjectured that they grew out of a party given by Cabell "in honor of the Kappa Alpha fraternity" and followed by a dance on January 18, 1898. On March 31, more than two months after the supposed "incident," the rumor first came to the attention of the faculty. After the regular faculty meeting, they discussed these rumors of "certain practices alleged to have been in existence between students and between students and certain college officers tending to the detriment of the College. Waiting further information," they adjourned until the following day. The next day, Friday, April 1, the faculty with all due discretion resolved to investigate the matter "as soon as circumstances permit." However, before they could act on the resolution, on April 6, at 9:00 p.m., a faculty meeting "was called on request of certain students who desired an immediate investigation to be instituted, so that they might vindicate themselves from the charges of certain practices rumored to exist in College." The "certain students" were presumably Cabell and two other boys apparently mentioned in the rumors. The faculty "after some discussion" complied with the requested inquiry, and began to swear in students to give testimony at once. The next day, Thursday, April 7, the investigation resumed at 5:00 p.m. and lasted for the rest of the week. The campus was in an incendiary condition, and, at one point on Friday, April 8, the students were near riot state in the Chapel, protesting that the faculty was persecuting fellow students while not considering its own dirty linen. Apparently, the rumor-victims were getting the support of their fellow students. Hearing of the student gathering, the faculty sent Professor Stubbs to quiet them. He assured them that the faculty was acting in all fairness; the students cooled down. After a thorough investigation, and after carefully weighing the evidence over the weekend of April 12, on Monday the faculty gave the opinion "that no evidence has been adduced before it sufficient to warrant a finding against" Cabell and his two friends. Whether other students were mentioned in the rumors, the Faculty Minutes do not say, but Cabell was cleared of all charges levelled against him by rumor. After the exoneration of the students, however, the Minutes record that the name of Charles W. Coleman "frequently" had arisen in the investigation. Because of this fact, "the Faculty feels impelled to state that no evidence has been adduced before it sufficient to warrant a finding against him." Nevertheless, "On account of [his] recent accident," writes Coleman to the faculty about his fall in the library, "and the shattered condition of [his] system"—aggravated no doubt by vicious rumors—he had to resign his position as librarian. Unfortunately, this resignation has often been misconstrued as an admission of guilt by those who did not know of Coleman's accident and his extremely weakened condition: he could hardly walk. Further, his letter of April 24, 1898, to his mother, may give us a clue to the origin of the rumors. In his letter, Coleman discusses his injuries both physical and spiritual, and immediately goes on to talk of religious matters. 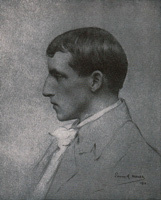 From his comments, Coleman was a religious liberal, believing that the essence of religion was in the "spirit" rather than in dogma or ritual; and somehow he seems to connect his present condition with his religious views. Is it possible that, though the rumors suggested "homosexuality," the actual incident (if there ever was an "incident") was a quarrel about religious liberalism? In the last days of Victoria, with the impact of Darwinism and Higher Criticism, religion was an explosive topic; and religious liberalism might easily be equated and confused in a small town with "other" abnormalities. However, as the faculty reached its decision and cleared Cabell and the others of misconduct, the three boys appeared before the faculty and asked that their names be removed from the College rolls. Possibly moved by indignation that they should be subjected to suspicions of homosexuality, they said their stay in Williamsburg was no longer "pleasant or profitable." Their statement ends with an affirmation of their innocence. Although these final months may have been dark, much of Cabell's stay at William and Mary was "pleasant and profitable," and even the confusion and misery of this regrettable "incident" may have been of some value to the author who later so violently satirized the pretensions of society and depicted the terrors of mob-justice. But Cabell took more away from Williamsburg than a feeling of "savage indignation." He had been a scholastic success; his knowledge and learning were to prove invaluable to the writer of romance and his creative work first published in the obscure William and Mary College Monthly is the seed from which the achievement of later years grew. 1The materials for this study were drawn from various primary sources : William and Mary College Monthly (1894-9 8); the College Catalogue (1894-98); Faculty Minutes of the College of William and Mary (1894-98); the correspondence of Charles Coleman in the Earl Gregg Swem Library, College of William and Mary; "The Seven Wise Men of the College of William and Mary in Virginia," an address by James Southall Wilson; and private conversations with Margaret Freeman Cabell and Professor Edgar MacDonald. 2Joe Lee Davis, James Branch Cabell (New York, 1962) , p. 151. 3Jurgen (New York, 1919), pp. 4-5. 4''There were three copies of the Rubaiyat in Cabell's library. See Jean Maurice Duke, James Branch Cabell's Library: A Catalogue (Ann Arbor: University Microfilms, 1968), p. 121. 5Emmett Peter Jr., "Cabell: The Making of a Rebel," Carolina Quarterly, 14 (1962), 74-78, discusses this material, but comes to different conclusions. I wish to emphasize the element of conjecture involved in precisely locating the incident which led to the rumors of homosexuality. Cabell and Coleman attended both the party and the dance which followed it by some days. 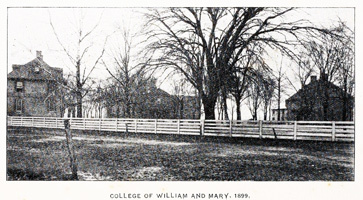 6At William and Mary in 1898, the basic graduating degree was an L.I. (Licentiate of Instruction); the B.A. was a slightly advanced degree, entailing more academic work, though obtained in four years. It is also worth noting that, at the end of his junior year, Cabell received the Corcoran Scholarship for his academic achievement.